Part 1: THIS CORRESPONDING BOOKLET contains a powerful message from the DVD, Basic Principles, Part 1 of the series titled Relapse. It explains basic information about how to prevent and manage the problems of relapse. The first of a three-part presentation reviews eight basic principles of relapse prevention. The edited transcript will reinforce the learning experience and provide an accessible reminder of the problems of relapse and the general steps that are necessary to manage it should it occur. Part 2: THIS CORRESPONDING BOOKLET contains a powerful message from the video, Relapse Warning Signs, Part 2 of the series titled Relapse. It describes the basic progression of relapse warning signs that lead from stable recovery back to addicted use. The edited transcript will reinforce the learning experience and provide an accessible reminder of the warning signs that precede relapse. 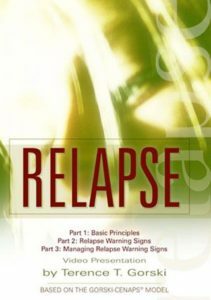 Part 3: THIS CORRESPONDING BOOKLET contains a powerful message from the DVD, Managing Relapse Warning Signs, Part 3 of the series titled Relapse. It explains how to use the relapse warning sign list as a powerful tool for identifying and managing the problems that could lead to relapse. It explains how to review the warning sign list and how to select and personalize warning signs that are of personal importance. Then it shows how to map out common situations in which warning signs occur and how to manage these situations in a new, more effective ways.